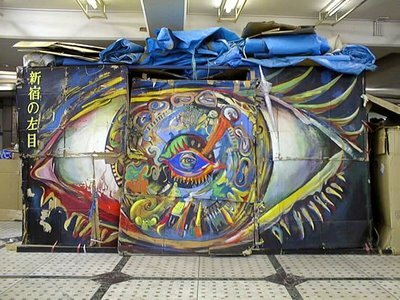 These photos show painted cardboard shelters in the homeless city that took root in the underground sprawl of Shinjuku station’s western wing in the mid-1990s. A deadly fire swept through the community in February 1998, forcing the inhabitants out and conveniently allowing the city to proceed with long-awaited plans to construct the moving walkway that now exists there. The paintings were also lost in the fire. Be sure to check out the photo galleries here and here. Fascinating stuff. and now i know how to do up my new house. What a shame that they were burnt. I’m sure they took a lot of time (and creativity)to paint.